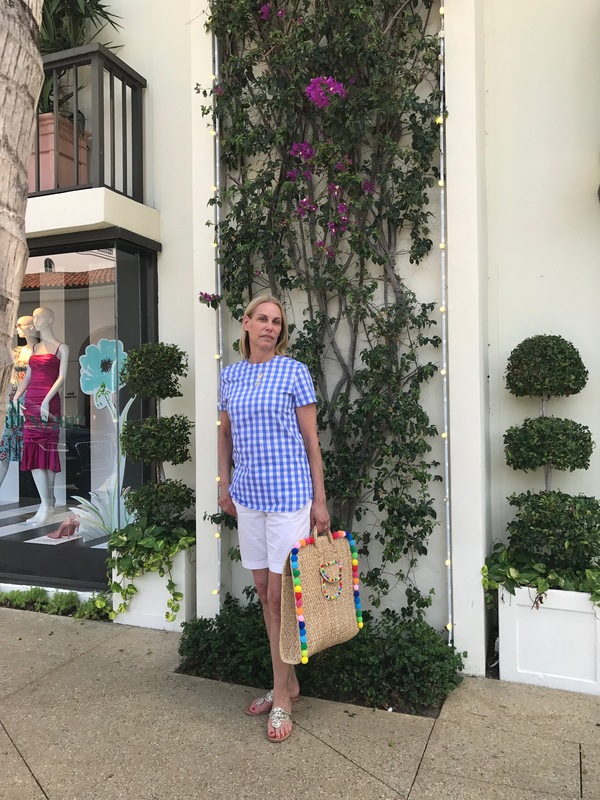 We loved our time in Delray and love the beach but try to stay out of the sun from 12-4pm. 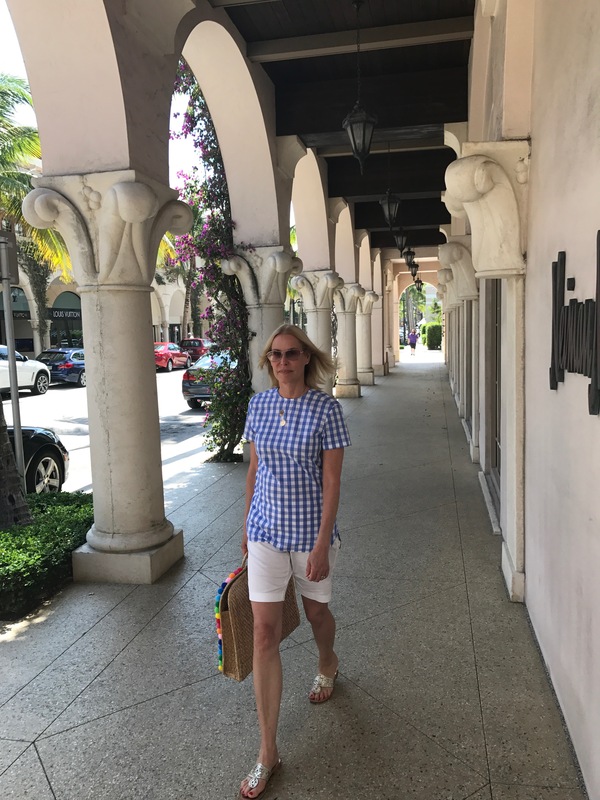 So besides naps (or work), we decided to make a getaway to Palm Beach and wander around Worth Avenue. Of course, my DIY PomPom bag had to make the trip. And it made quite a splash. Really. I got stopped so many times. I almost thought I should be selling them! But I do have a card for Life’s a Spritz that I try to always have on hand, so perhaps I’ve got a few new followers. My inspiration? We were at the beach, it was super hot, I kept my look simple. 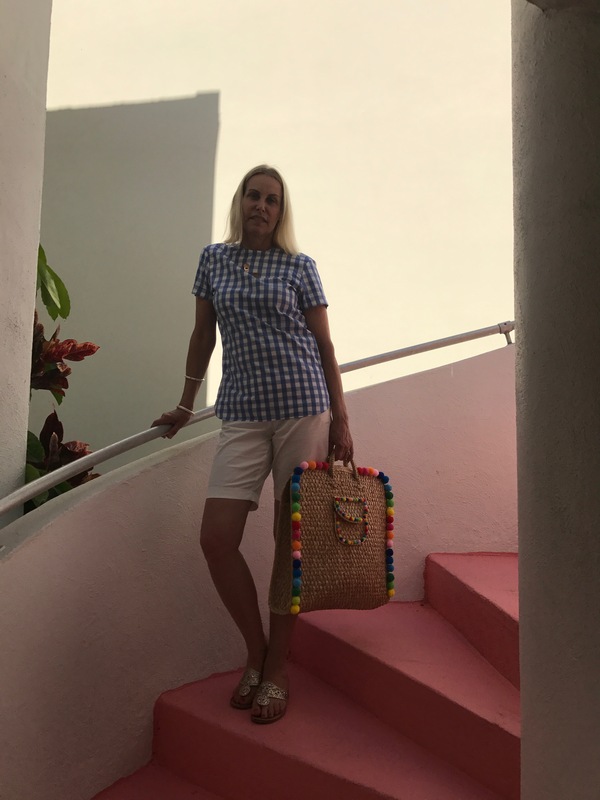 A crisp, blue-and-white gingham top, white Bermuda shorts and, of course, Jack Rogers. 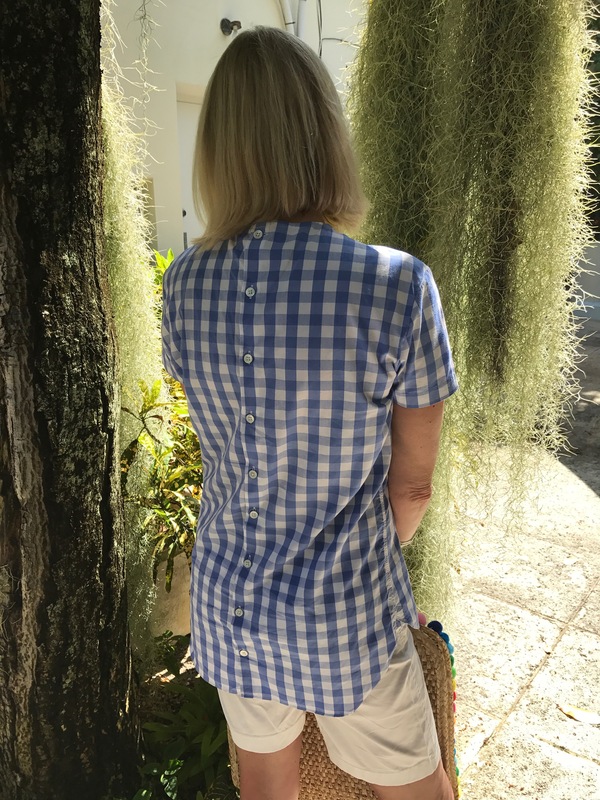 The difference was in the details: the buttons up the back of my top add a subtle but stylish difference, the shorts are cotton with just a bit a stretch for fit and comfort, and the JRs are, for me, a casual summer wardrobe must. These are in platinum, and I never say no to a touch of sparkle. I have them in black patent, navy and white (monogrammed! ), orange and white and snakeskin, too. If I can I add a new pair every summer or two. They go with everything. And hey, just get better with age. I didn’t shop much on this trip, but I picked up a pair of gorgeous white enamel bangles at Sequin, the PB outpost of an NYC-based Jewelry Design Studio. 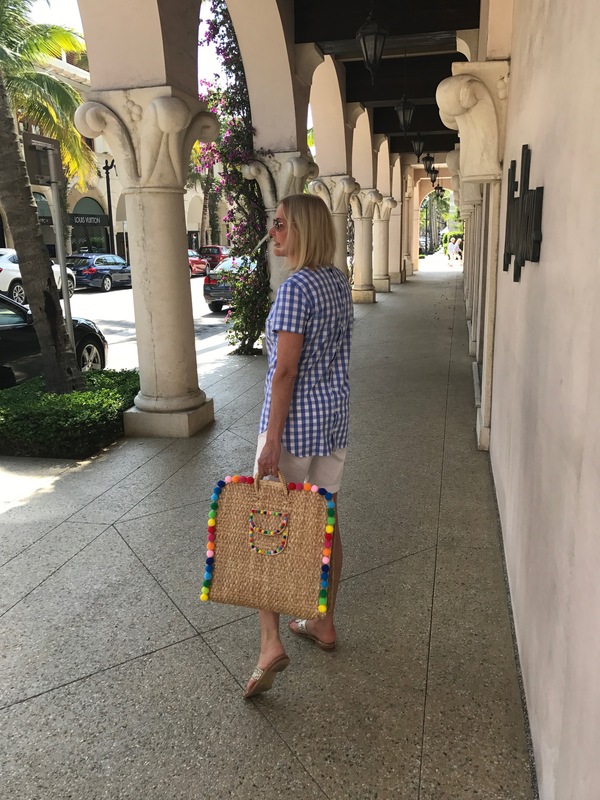 Founded by two sisters, they have a rainbow of options to choose from and support a rainbow of good causes! Shorts: J. Crew, pretty much sold out in white but love them in yellow! 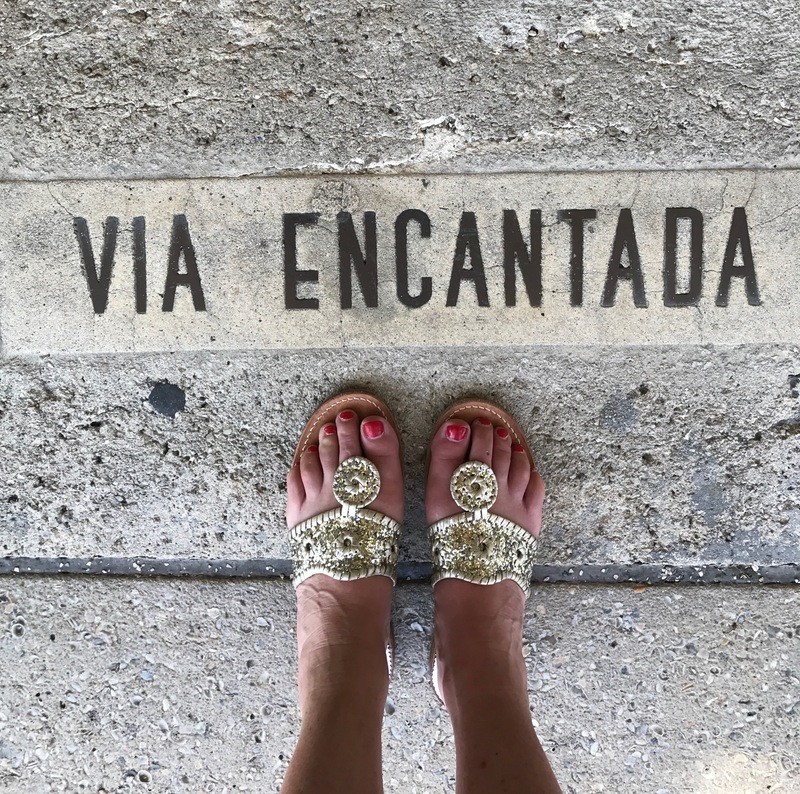 Sandals: (old, Jack Rogers) but take your pick here! And monogram options here!! 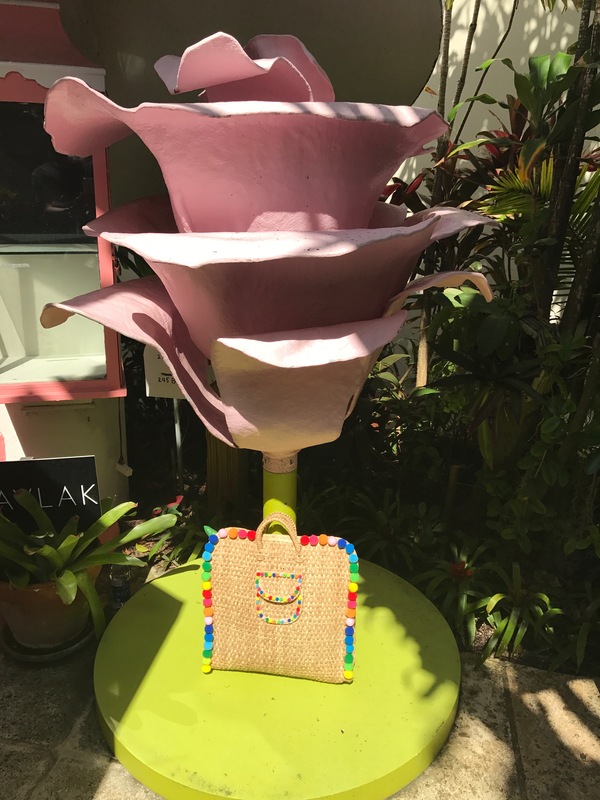 I love your very colorful pom-pom bag, this would be perfect for vacation.